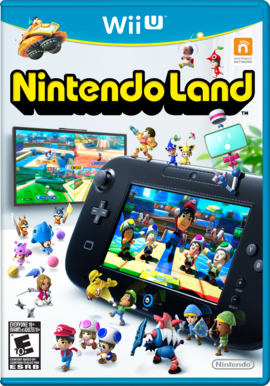 Nintendo Land is a launch title for the Wii U, which was first released in North America on November 18, 2012, Europe and Oceania on November 30, 2012, and Japan on December 8, 2012. The game's setting is based on a virtual theme park, containing twelve minigames (referred to as attractions by Monita, the game's host) built around various Nintendo franchises, including four based on Mario and its subseries. The minigames are played using alongside up to four (with ), and are intended to showcase the many new features of the Wii U. In North America, Europe, and Oceania, Nintendo Land comes packed in with the Wii U Deluxe Set. It is also sold as a stand-alone product where players can buy it if they have the Basic Set. It was removed from the Nintendo eShop in North America on November 10, 2013, and was readded to it on August 26, 2016. The Legend of Zelda: Battle Quest Takes place in a The Legend of Zelda-based world, where the Miis are dressed up as Link, sharing Hearts. They must fight many enemies along the way. The player with is an archer, providing backup, while the other players with act as swordsmen. Pikmin Adventure This multi-player minigame is based on Pikmin. The player acts like Captain Olimar, using and the stylus to control a group of Pikmin through missions to find the lost spaceship. The players with act as giant Pikmin and fight alongside him. Metroid Blast Based on the Metroid series, the players dress up like Samus Aran in a space area. The player drives a gunship, while the other players combat against or with them on ground. Mario Chase Based on the Super Mario series, this minigame involves four players dressed as Toads running through a Mario-themed park to find a solo player who is dressed as Mario. The solo player can see where the team is on . The Mario player runs faster than the Toad players, so the Toad players must cooperate to trap the Mario player. Luigi's Ghost Mansion In this minigame, four players are dressed as Mario, Luigi, Wario and Waluigi. Each player tries to attack the solo player (in a Gold Ghost costume) using flashlights. However, the solo is invisible and can be seen only on . The setting is a reference to Luigi's Mansion. Animal Crossing: Sweet Day The solo player controls two guards (dressed as Copper and Booker) and must chase the team players who try to collect a certain number of candies scattered throughout the town before time runs out. However, team players get slower each time they collect a candy. Note: This game can actually play up to 6 players by having two players share to control the guards cooperatively. These minigames can be played only by a single player, but other players can help by using special abilities that the player with the GamePad cannot do, such as getting rid of obstacles in Captain Falcon Twister Race and freezing enemies in Takamaru's Ninja Castle. Yoshi's Fruit Cart This attraction's name and gimmicks are based on the Yoshi franchise. The player must draw lines on , starting from their cart, which is modeled after Yoshi. These lines will guide the cart when the game begins. The lines must coincide with every fruit, so the cart will pass through them in the order the fruits are numbered. When all the fruits are collected a door will open, and the cart must pass through it to clear the level. However, the fruit is invisible on the GamePad. Octopus Dance This game is based on the Game & Watch game Octopus. The player must memorize the moves of the character on the TV screen and repeat them using either the control sticks or the gyro sensor. Donkey Kong's Crash Course This minigame is aesthetically based on the arcade game Donkey Kong. The player must navigate through a series of paths and platforms by tilting , which moves the player's cart, collecting bananas and checkpoint flags along the way. The and buttons are used to operate special white platforms. Takamaru's Ninja Castle This minigame is based on the Family Computer Disk System game Nazo no Murasame Jō. Here, the player must use the screen to throw shurikens at ninja enemies. Captain Falcon's Twister Race In this F-Zero-themed game, the player must guide a high-speed wind-up vehicle to the goal while holding vertically. The player must avoid obstacles and follow the track by tilting from side to side. Balloon Trip Breeze The player controls their character through the sky collecting balloons and avoiding obstacles, just like the NES game Balloon Fight. The game has been well-received. GameXplain gave the single-player 4 stars out of 5 and the multi-player 4.5 stars out of 5 and referred to it as the best Nintendo multiplayer game since Super Smash Bros. Brawl. GamesMaster gave it 86/100 (86%), describing it as "An essential purchase for party lovers that whets the Nintendo appetite. Bring friends." IGN gave it an 8.7 score out of 10, and GameSpot gave it a score of 8 out of 10. Oli Welsh, Eurogamer 8/10 "It's not just half a dozen great diversions and a few more besides; it's sweet fan service that celebrates Nintendo's catalogue with more heart and less calculation than we've seen of late. Better yet, it reclaims the used and abused mini-game compilation from the hollow hinterlands of the casual cash-in, lovingly restores it and puts it back where it belongs - amid the hustle, the buzz, the urgent appeal of the arcade. Roll up, roll up!" Audrey Drake, IGN 8.7/10 "Nintendo Land is a brilliant show of what Nintendo’s new console and tablet controller are capable of, and has far more depth and content then you’d expect from a mini-game collection. The attractions are ridiculously fun and offer plenty of variety, whether you’re flying solo or entertaining a group. Throw in high scores to best, gold trophies to earn, stamp achievements to collect and tons of Plaza decorations to unlock, and what you’ve got is an experience that must not be missed, and probably the best show of Wii U available at launch. Carolyn Petit, GameSpot 8.5/10 "Like Nintendo Land's use of familiar properties, this bevy of prizes to collect wouldn't be worth much if it wasn't supported by good gameplay. Thankfully, it is. Nintendo Land isn't just a fine showcase of the Wii U's capabilities, though it certainly is that. It's also a great game in its own right, and particularly if you have friends or family members with whom you can play all of the multiplayer attractions, it's a great way to start getting a lot of enjoyment out of the new console immediately." Nintendo Land is the 5th best selling game for the Wii U, selling 5.19 million copies worldwide, as of September 30, 2018. For this subject's image gallery, see Gallery:Nintendo Land. When heading to an attraction, at the start-up screen, the player can hear tunes from previous games of the series that the attraction is based on; this music grows louder the closer the player is to an attraction. The player can use coins obtained in the minigames to play a kind of retro style pachinko mini-game. The player can win ? Blocks that, when opened, reveal different prizes based on objects found in the attractions. The credits theme features music from various Nintendo series represented. The Overworld and Stage Clear tunes of Super Mario Bros. play near the end of the theme, and the medley finishes with title screen jingle from Super Mario Galaxy. This page was last edited on April 13, 2019, at 23:44.